Bankers should love the little creatures of the cold. Be they birds in the air, squirrels in the trees, or mice on the ground, they believe in saving, although they do it with cache, not cash. Most of our year-round birds and many of our small mammals long ago learned to save – not for rainy days, but cold and snowy ones. While many large animals like bears store winter nutrition in their fat, birds and rodents are too small to carry enough fat to get through winter. So they cache food, stuffing it in the nooks of nature so they will have something to eat at harsh times like these. 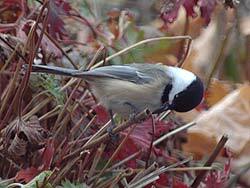 Some tight-beaked birds, like chickadees, watch over their accounts like bank auditors. They patrol the seeds they have stashed in bark, rock fissures or even under roof shingles. If any are missing, they are soon replaced. If you think that's easy, consider the chickadees in frigid northern Canada who each stash tens of thousands of seeds over several acres. Could Deloitte and Touche's best bean counter keep track of those accounts?